A new ranking names Samford University Cumberland School of Law’s national trial team as number two in the nation for 2017-2018. 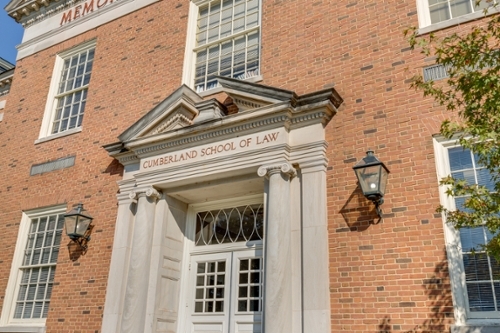 The Trial Competition Performance Rankings compiled by Fordham University School of Law has named Cumberland’s national trial team as one of the best in the country. The rankings are an objective snapshot of achievement in interscholastic law school trial competitions for the academic year. Cumberland’s success continued at Baylor University School of Law’s Top Gun National Trial Competition. This innovative, invitation-only mock trial tournament invites the single best advocates from the top 16 trial advocacy schools across the nation (based on results from the other major national competitions) to go head-to-head for the honor of being designated as “Top Gun.” The case is not provided to the students or coaches until one day before the first trial begins. Created in 2010, this competition is innovative and unique. Preparation includes reviewing depositions, records, and photographs, and making a site visit to view the scene where the events occurred. Shortly before each round, competitors are assigned the witnesses who may be used at their discretion during the round. The jurors for each round are distinguished trial lawyers and judges. Second-year student Craig Shirley of Dothan, Alabama, represented Cumberland in the competition. Shirley finished 3-1 at the competition placing him sixth. Fellow second-year student Stephanie Gushlaw of Potsdam, New York, served as Shirley’s second chair and won the award for Best Technology. The award is based on the most effective and persuasive use of technology in the presentation of the case. Cumberland students used TrialPad to display exhibits, depositions, jury instructions, verdict forms and PowerPoint presentations created for the fact pattern. To learn more about Cumberland’s national advocacy training program, see here.